Home games were played at the Staff College Owl’s ground at the RMA Sandhurst. 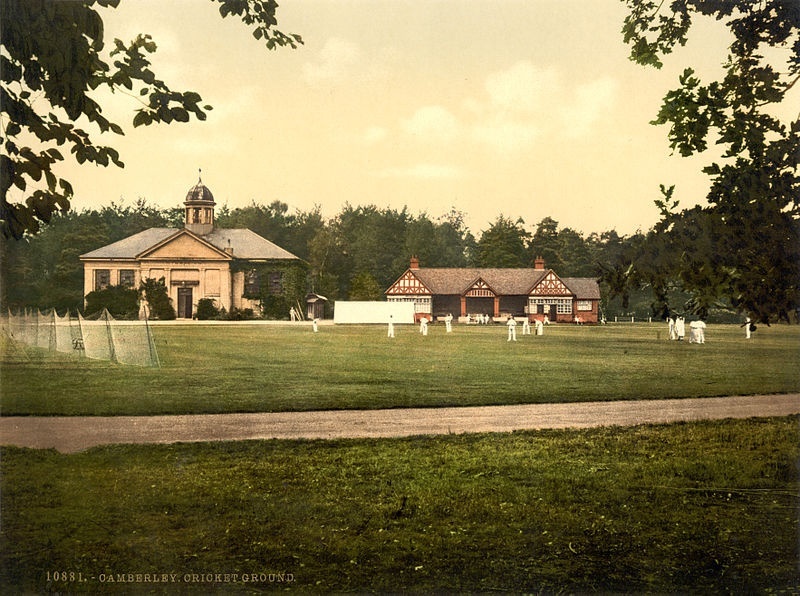 In 1947 Camberley Cricket Club rented land in the Watchetts Estate for 14 years at the nominal rent of one shilling per year from W B Verran and accepted the responsibility of turning the land into a cricket square. In 1950 the cricket square was by Messrs Glaze of Kingston. In 1951 Camberley Cricket Club played their first game of cricket at the new ground. In 1952 the ground and pavilion was officially opened by Mr F W Doidge, the High Commissioner for New Zealand with a fixture with the London New Zealand Cricket Club. In 1969 Camberley were losing finalists in the Kemp’s Cup, covering the whole of the South East of England at the Oval. Camberley Cricket Club sold the land surrounding the current grounds in 1970 which became Upper Verran Road. The ground was sold to finance a new pavilion. In the same year CCC won the Flora Doris Cup. A year on and to celebrate the opening of the new Pavilion in 1971, Camberley hosted a charity match against a celebrity SPARKS XI. In 1972 Camberley joined the Surrey County League and won it in its inaugural year. They also won the Flora Doris Cup. In 1979 CCC moved up to the Surrey Cricketers League. In 1987 CCC joined the Surrey Championship. In 1992 the club engaged in bringing in it’s first overseas player – Abbi Tatkar. In 1993 the club engages in its first contracted player – Kevin James (Hampshire & CCC). In 1994 Camberley CC celebrates it’s 50th anniversary with a benefit match for Paul Terry (Hampshire & CCC) and a charity dinner with Ian Botham as guest. In the same year CCC achieved a full year of fixtures for 4 senior 1st XI teams on a Saturday. In 1995 CCC sold off part of the woodland on the ground to help fund a new 2 storey pavilion. After 3 years of construction, 1998 saw CCC unveil their new pavilion to the public with a celebratory charity match against Bunbury 1st XI. In 1999, once again CCC won the Flora Doris cup. In 2003 the 1st XI Team were promoted to Division 1 of the Surrey Championship. In 2005 CCC changed constitution with club registration under the Industrial and Provident Societies Act 1965, which provides the club with limited liability status and removed the need for trustees. In 2011, Camberley are promoted the Premier League for the first time in it's history as champions following an almost unbeaten season. losing just 1 game. 2013, 12 girls make Club history by attending the first ever dedicated girls training session and take the field later in the year to play the first girls games at Camberley CC v Aldershot. Camberley Cricket Club is proud to be growing in strength year after year. We run 7 Junior teams, 3 Senior teams on Saturdays and two Sunday XI's as well as providing a great facility and backdrop to host functions and events. Camberley CC doors are open to all so please check out our fixtures diary and come down and enjoy some great games of cricket. If you'd like to become part of Camberley Cricket club, either as a Social Member or to play cricket, please visit the Information tab and click on 'Documents' for further details.